Training with a kettlebell is a great way to build muscle strength, ultimately leading to an increase in your lean muscle tissue and decrease in your body fat. How does this happen? Many kettlebell exercises are dynamic movements that require you to use several muscle groups together. The more muscles you are working and the more lean tissue you create, then the higher your metabolism will be and the more fat your body will burn. 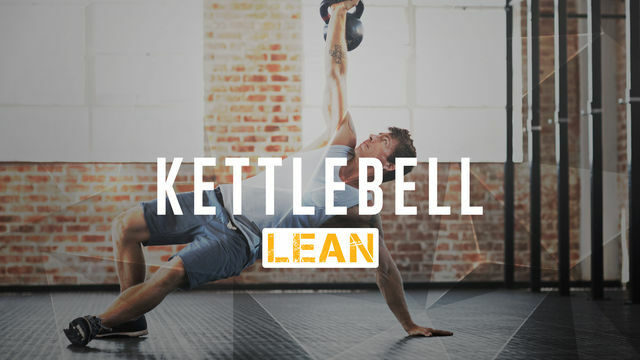 The Kettlebell: Lean program is packed with some staple kettlebell exercises, as well as some 'out of the box' kettlebell movements to keep you on your toes. Each one of these moderate intensity workouts are full body, however, they also have an additional major focus area, like core or cardio. You will need at least one moderate or heavy weighted kettlebell for each workout, but the more kettlebells you have available, the better! Pick a kettlebell with enough weight to challenge your ability in each exercise. Kettlebells are calling, are you ready?